Internationally renowned and award winning Sardinian jazz vocalist/lyricist, producer and theatre director, Filomena Campus lives in London and Berlin. She has toured and collaborated with top UK jazz musicians including Paolo Fresu, Evan Parker, Guy Barker, Orphy Robinson, Huw Warren, Byron Wallen, Cleveland Watkiss, Jean Toussaint, Antonio Forcione, Tony Kofi and the London Improvisers Orchestra (Filomena features in the CD by the LONDON IMPROVISERS ORCHESTRA: Improvisations For George Riste’). In 2010 Filomena founded the ‘Filomena Campus Quartet’ with Steve Lodder, Dudley Phillips and Winston Clifford. Their new original project is called JESTER OF JAZZ , with music by Steve Lodder and Dudley Phillips and lyrics by Filomena Campus. The CD Jester of Jazz, with Jean Toussaint and Rowland Sutherland as special guests, was presented in January 2011 at Pizza Express Jazz Club in London with jazz star trumpet player PAOLO FRESU as special guest and has received excellent reviews internationally. Filomena Campus' new project DÙOS with renowned guitarist and composer Giorgio Serci will be released soon. Filomena Campus is Theatralia Artistic Director. Productions include 'Not in My Name' inspired by The Living Theatre and 'U238' by Marco Paolini, 'Dot Dot Dot', an adaptation from Dario Fo and Franca Rame's texts. Since 2006 Theatralia’s production have been sponsored by the Arts Council England. Their acclaimed production ‘Misterioso. A Journey into the Silence of Thelonious Monk’, written by Stefano Benni, was presented at London Riverside Studios and at the Edinburgh Festival, featuring top jazz musicians such as Tony Kofi, Orphy Robinson, Jean Toussaint and Byron Wallen. Theatralia have performed once a year their ‘Interludes’, multimedia performance/happenings of free improvisation and performance art featuring top UK jazz musicians, performers and visual artists. Filomena has performed in several international festivals such as Edinburgh Festival, Berlin Italian Jazz Festival, Wolfsburg, Labin Festival- Croatia, Forma e Poesia nel Jazz, Nuoro Jazz, Capalbio, Orfeo Cinto di Mirto, Roccella Ionica Jazz Festival, Time in Jazz, Birmingham International Jazz Festival, Notting Hill Jazz Festival, Manchester Jazz Festival, Nottingham Jazz Festival. 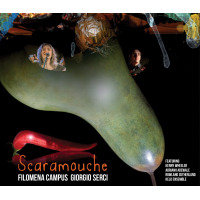 In 2008 Filomena Campus was invited to the Italian Jazz Festival at Roccella Ionica with a project created with acclaimed author Stefano Benni, Italy VS England‘, featuring Orphy Robinson, Pat Thomas, Rowland Sutherland, David Leahy. In 2004 Filomena Campus co-founded the acclaimed jazz quintet In Kimbe with internationally renowned flautist Rowland Sutherland. They recorded In Kimbe CD in 2007. In the same year Filomena Campus took part to the Mozambique Empty Boat Tour, performing with the UK band Empty Boat and the Mozambican band Massukos, shooting a film documentary to raise awareness about sanitation and water in Mozambique in collaboration with Water Aid. In 2002/03 Filomena joined the UK Nubian Vibes Tour led by long time collaborator and friend, the acclaimed vibraphone player Orphy Robinson. Robinson also invited Filomena to join his band Quattro+, featuring Pat Thomas, Dudley Phillips and Kenrick Rowe, performing in major UK jazz festival and live on BBC Radio3. In 2001, prior to her relocation in London, she directed and performed in ‘A Game of Chess’, her first experiment mixing theatre and live jazz, in Cagliari, Italy. The project was inspired by the work of Beckett, Joyce and TS Eliot and featured top jazz Sardinian musicians. All About Jazz musician pages are maintained by musicians, publicists and trusted members like you. Interested? Tell us why you would like to improve the Filomena Campus musician page.